At 6ft 6 and 19st, finding a bed that is comfortable and supportive is no easy feat for a man the size of Matthew Symons. Yet the Harlequins lock forward found the perfect match in Mammoth, thanks to the Rugby Players Association website and recommendations from other professionals. Matthew Symons’ rugby career has been a varied one. Although he had been playing the game since the age of 5, Matthew describes himself as a late developer – having not turned professional until the age of 24. It was on the other side of the world that Matthew really found his big break, earning a contract in New Zealand with Canterbury – an achievement he still cites as the proudest point in his career. During a three year spell in the Southern Hemisphere, Symons would go on to represent not only the Crusaders but also the Chiefs, before heading back to the Premiership where he has since gone on to play for London Irish, Wasps and most recently Harlequins. At 6ft 6in and 19st, recovery time is crucial to a player of Matthew’s size and frame. Between matches, his typical training regime includes a heavy workload of weights, running and skills work – all of which place immense strain on the body. While Matthew says that his general health has been good over the course of his career and he has so far managed to avoid many of the problems faced in the modern game, he says that rehabilitation and recovery time is crucial to keeping the body in good working order. “I like to aim for a solid 9 hours sleep a day. If I don’t quite make that quota I will try to factor in a nap around training and ensure that I am giving my body and mind enough time to restore itself. “I would class myself as a medium to deep sleeper and I’m quite good at sleeping in most environments. But I always make sure that I take a set of headphones away with me to games in case I end up with a roommate who snores! For me, it’s also important that I have a cool and clean sleep environment and I always leave a window open when I’m in bed. 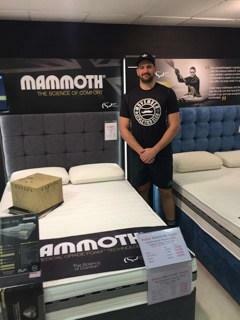 Matthew first came across Mammoth via the RPA’s website and he says that the many testimonials and reviews from his fellow professionals convinced him to visit his local retailer Tudor Williams to test drive a mattress for himself. “Once I started researching mattresses I quickly learnt about the benefits of Mammoth in terms of recovery and performance optimization. The quality of the reviews from other athletes was impressive and so I went to Tudor Williams in New Malden to find out for myself. Matthew Symons purchased a Kingsize Performance 240 from Tudor Williams in New Malden.